Does Our National Accounting System Reflect Our Values? I am a big fan of Elizabeth Kolbert’s writing. I’ve read just about everything she’s written in the past few years, and I also attended a talk she gave at a local college (she lives not too far from me). 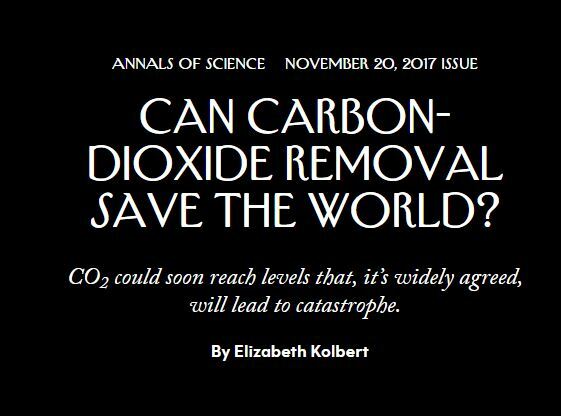 The most recent (November 20, 2017) issue of The New Yorker published a piece by her on the subject of stopping (and even reversing) the practice of adding carbon dioxide to our atmosphere. The article makes several important points, and I highly recommend it if you’d like to understand the necessity of this process, as well as the daunting challenges we face in making it a reality. In order to achieve the goals of the Paris Agreement, carbon dioxide removal is likely a necessary step. Yet, there is no easy path forward. The technology is in its infancy, and it’s not clear how well it will scale up. There are many moving parts, here, of course: technological, economic, and political. The focus to date has been on reducing carbon dioxide emissions. This has led to an emphasis on renewable fuels, but the implementation in some areas leaves a lot to be desired. The production of ethanol, for example, creates large amounts of CO2 which is released into the atmosphere. Similarly, the burning of biofuels undoes the natural carbon sequestration that occurs when plants grow. Part of the problem here is that there is no economic incentive to capture CO2 emissions. 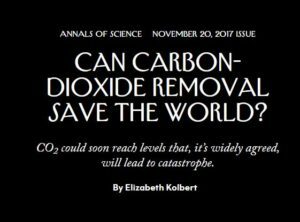 Kolbert argues that we have made a mistake by treating carbon dioxide as an evil presence, rather than a waste product that, like sewage and trash, needs to be dealt with. She points out that it is unlikely the world will reduce, much less eliminate, carbon dioxide emissions anytime soon. The only path the stopping things from getting worse, in terms of the concentration of the gas in the atmosphere, is to capture it at its source of production and store it away safely in some form. Beyond that, it is necessary to remove some of the overabundant supply already in our air, which is creating climate change, and will continue to do so, almost no matter what we do now. This is not a very upbeat article, because it starkly points out how bad things are at present, but at least it does offer a possible path forward, and that’s better than having no hope at all.